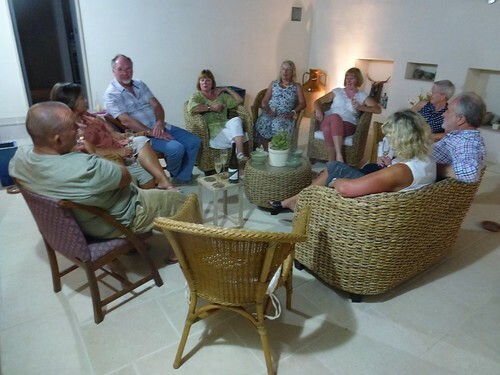 In between my 60th birthday party and the wine harvest there was a lot of eating, drinking and having a good time. 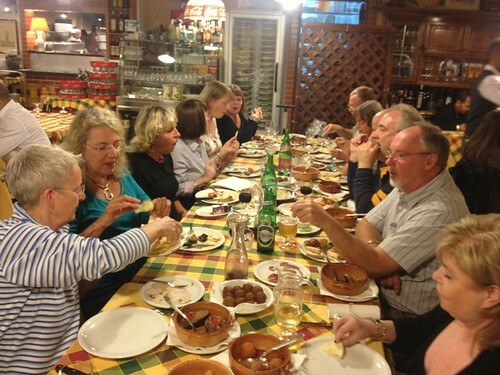 Friday: We started as soon as the plane landed by going straight from the airport to Pizzeria Pizz Birr in Locorotondo, as we landed quite late, arriving at the restaurant just before 10pm. They do real crisps - thin slices of potato deep fried. They are delicious and make those things in packets sold as crisps look like third rate impostors. Home for a night cap and the revelation that it was Geraldine's 60th birthday on the Sunday. We thought it was around then but she had kept the exact date quiet. Sunday: Was my birthday party (qv) with a cake for Geraldine as well. Monday: We hosted a barbecue for thirteen. The ice cream parlours will sell you tubs of ice cream in various sizes of insulating, polystyrene containers which makes the dessert course easy. Tuesday: We went down to the coast for our mandatory visit to La Rotonda da Rosa for sunbathing and a seafood lunch. Wednesday: Geraldine and Alisdair left. That evening we went round to Kathy and Richard's for an aperitif and to show our friends the wonderful job they have done in renovating their place. Followed by supper at Il Giardino. Thursday: Andrea and Allen, and Tim and Sarah all left and we were down to two guests. 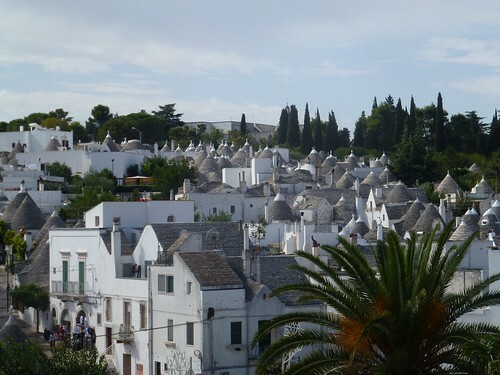 Friday: The obligatory trip to the world heritage site of Alberobello. 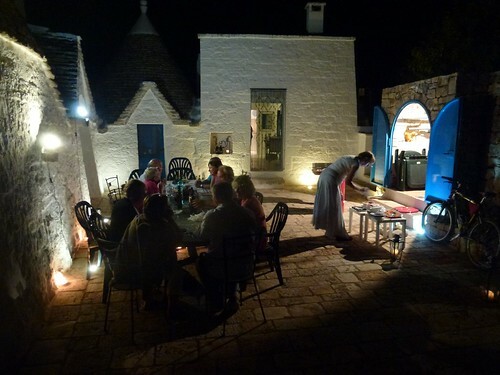 That evening a crowd of us went to Il Baretto, Martina Franco, for a meal cooked by Chris's Pilates teacher who as doubles as a caterer and was showing off some new recipes. She took over the venue and friends all signed up as paying guinea pigs. Saturday: Barbara left and a quiet evening in with Andrea. Tuesday: Andrea left and we were down to just us. Wednesday: A trip to the nearest big DIY store (Leroy-Marlin) in search of a washing line pole. 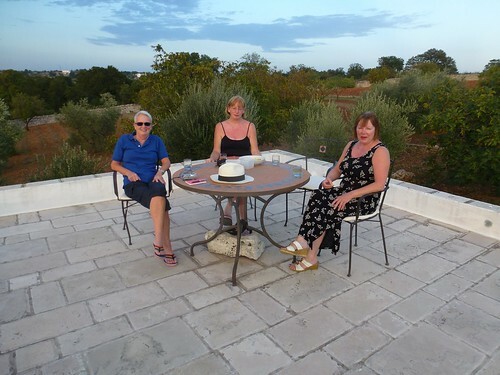 Thursday: Installed washing line pole, relaxed and went to view some properties for sale in Cisternino old town. Went for cocktail and decided to make an offer on one. That had not exactly been on the plan for this trip! Friday: Signed a Compromesso - a legal contact - and arranged for the deposit to be transferred to our Italian bank account. I will blog later when the deal is sealed, with the full back story. Saturday: Home to start some serious Flickr and blogging. 20121006-puglia-60th-other, a set on Flickr. Absolutely perfect! It all looks so wonderful!! Lovely photos! !